Spartak Moscow scored twice in the space of a minute. 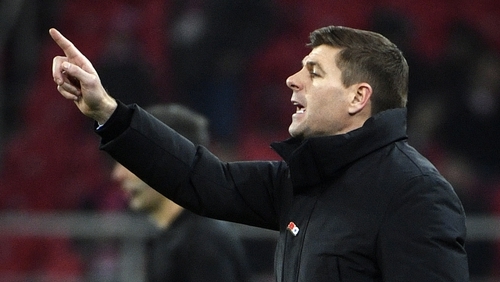 Rangers let a lead slip three times in Russia as two goals in the space of a minute consigned Steven Gerrard's side to a 4-3 defeat by Spartak Moscow. But Luiz Adriano headed another equaliser in the 58th minute and Connor Goldson - who scored a first-half own goal - inadvertently diverted Sofiane Hanni's strike into the net seconds later. Middleton was handed his second start for Rangers after a hamstring injury ruled out Ryan Kent while Katic was also among five players brought in following Saturday's victory over St Mirren. The goal spree began inside five minutes as Roman Eremenko headed Middleton's corner into his own net under pressure from Lassana Coulibaly. The hosts responded well and Allan McGregor made two stops from Salvatore Bocchetti before being beaten in the 22nd minute by Lorenzo Melgarejo's back-post header after Ivelin Popov turned Jon Flanagan one way and the other before delivering an excellent cross. Flanagan's through ball found Candeias unmarked as the winger beat the offside trap before producing a brilliant 18-yard finish.